With Backup4all for PC you can back-up your data in the Cloud to Google Drive, Microsoft OneDrive, Dropbox, BOX, Amazon S3, Microsoft Azure, Hubic, Hidrive and more than 37 Amazon S3 compatible cloud destinations. This way you benefit from the most powerful infrastructures for protecting online data, while using the backup program you're used to. It employs a unique system that decides automatically what backup type to use in order to save the most file versions (within the same allotted storage space) on your destination and improve the backup speed. Using the smart backup option you optimize the backup process and reduce decision time as you don't have to compare various backup types to chose what's more suitable. 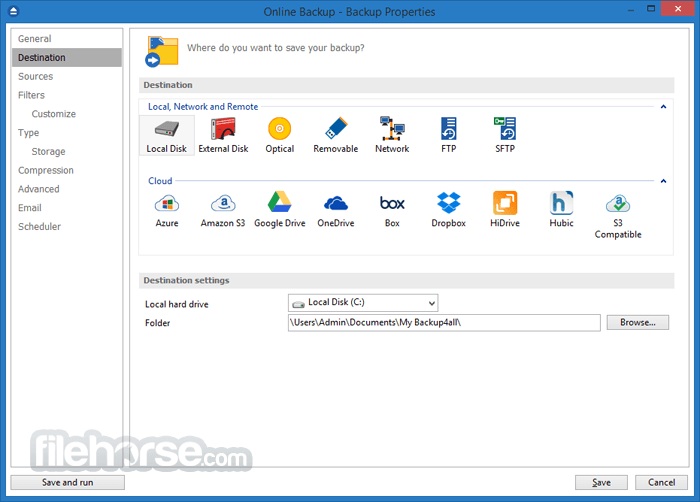 Backup4all was designed to be an easy-to-use backup program. It offers helpful wizards for backing up and restoring. The backup wizard lets you create a new backup job by selecting Where, What, How and When to backup. Restore is even easier, it takes just one click to restore data. It has a ribbon interface for quick access to the most important options. The Getting Started window allows you to easily define/run backup jobs or restore data. Switching to Explore View you can see all files/folders that are in the backup job and the new files that will be stored at the next backup execution. 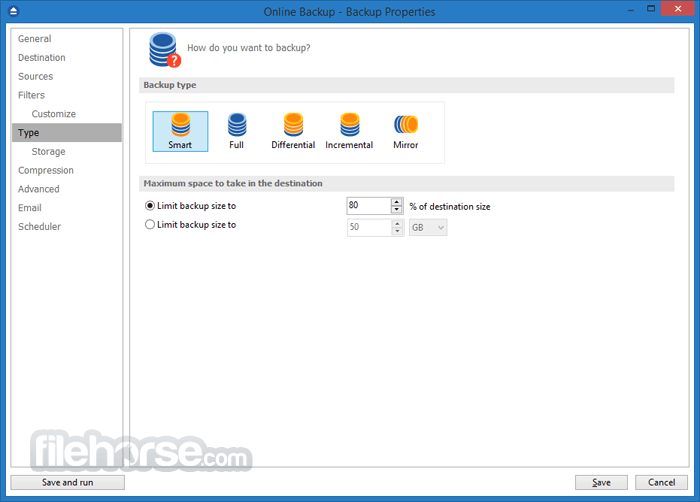 It offers four backup types to choose from: full backup, differential backup, incremental backup and mirror backup. By default it uses a smart backup option to automatically chose which backup type to execute for optimizing backup speed and keep the most file versions possible without exceeding the allotted storage space. It can backup to SFTP, a destination combining the security of remotely stored backups, with secure file transfer protocol. Your important data is transferred to the SFTP backup server using a secure network connection, to avoid the risk of data interception. 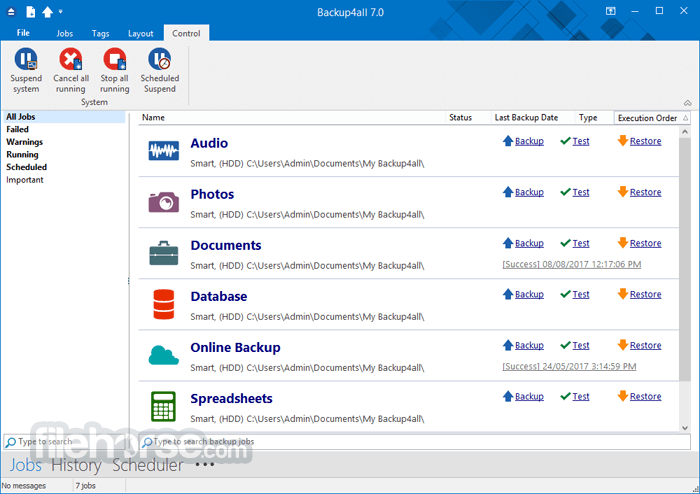 Backup4all has its interface translated in multiple languages and this allows you to use it efficiently especially if English is not your native language. You can see a list of all languages it is available in here: Supported Languages. The Mirror backup type creates by default an exact copy of files and folders selected as sources. This backup software gives you the option to compress files individually using standard ZIP compression. Furthermore, AES encryption can be used so that each file is encrypted and protected (the file/folder names are obfuscated in the zip archive). 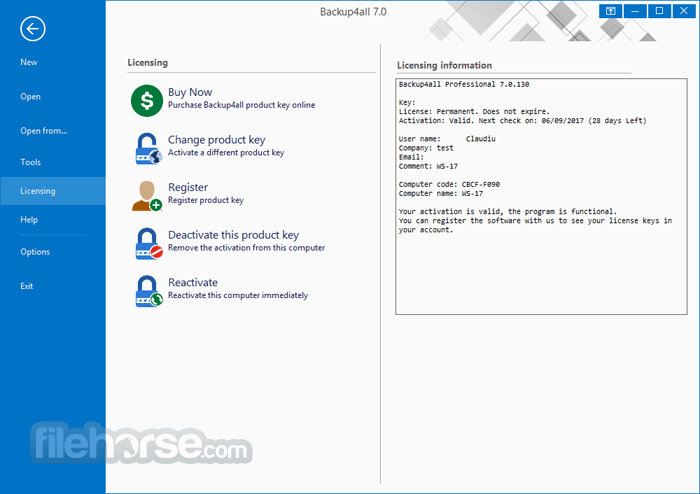 Backup4all is a backup software that offers an unique mode to track file versions. You can selectively restore any previous version of a file directly from the main window. It comes with its own built-in DVD/CD/Blu-ray disc burning engine. This means you don't need separate software to burn your backups to DVD, CD, HD-DVD or Blu-ray. However, if you prefer, you can still use 3rd party packet writing software to burn your CDs/DVDs/Blu-ray discs. The program creates standard zip files. This format is compatible with any zip utility currently available on the market. Unlike other backup programs, for zip files greater than 2 GB, Backup4all uses ZIP64 technology. This allows unlimited zip file size and also lets you encrypt your data using AES encryption (256-bits). This backup software uses the Volume Shadow Copy service. It allows you to back up open files (local) from NTFS partitions in Windows Vista, XP, 2003, 2008 Server and Windows 7. For example, you can backup Microsoft Outlook or Outlook Express emails and settings without closing them. Predefined backups, such as Backup4all for Windows Configurations, Google Chrome Bookmarks & Profiles, Internet Explorer Favorites, Mozilla Firefox Profiles, My Documents, My Pictures or Windows Live Mail, make it easier to back-up specific applications or data. Additionally, other backup plugins can be freely installed from our extensive online library. 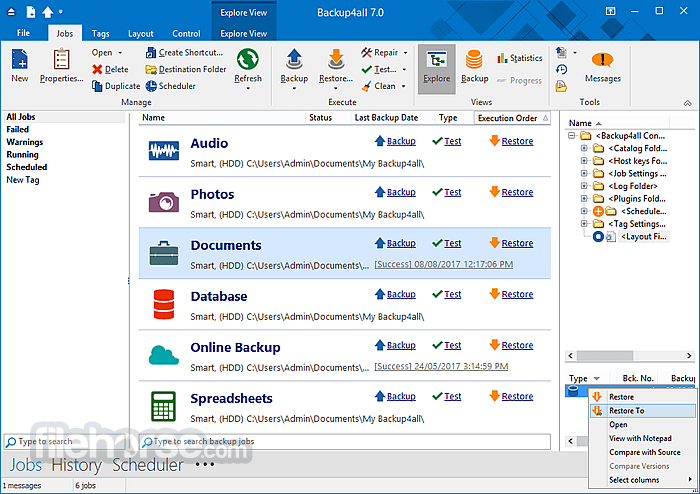 Using Backup4all's built-in scheduler you can define backup jobs that back up automatically your important files at specific dates. You can also set extra actions to perform before and/or after the backup execution. It has also a command line version. WannaCry Ransomware is one of the most aggressive crypto-viruses as it will encrypt your data and you will not be able to access it unless a ransom is paid. It protects your data against WannaCry Ransomware (WannaCrypt) by backing it up online to Google Drive, Microsoft OneDrive or other popular remote destinations. Thus, even if your data gets encrypted by WannaCry or other ransomware viruses, you'll still have uninfected copies stored online.